The famous canvas-on-oil painting "The rooks have returned" inspired Fedoskino artist Pavel Sladkov to create this box. 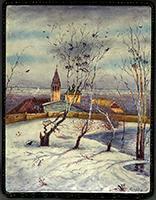 Painted in 1871 by Alexey Savrasov, this masterpiece currently hangs in the Tretyakov Gallery in Moscow. Alexey Savrasov (1830-1897) is one of the founders of Russian realistic landscape painting, master of urban and rural landscapes. Painted in the town of Yaroslavl, his painting "The rooks have returned" was displayed in the first movable art exhibition with a great success. The box depicts a landscape that is typical for Russian countryside: the spring is just arriving, and one of the signs of this is the return of rook birds. They are sitting in the branches of a tree that has not yet begun to sprout leaves, so their nests are clearly visible. Just beyond the trees, a pool of water, perhaps formed by melting snow, reflects the sky and landscape. In the middle ground stands a small village, with an attractive Orthodox church with small gold cupolas and a tall bell tower. A little puff of smoke rises from the chimney of the house on the left. In the distance, the fields, rivers and forests of the Russian landscape stretch off far into the distance, giving the feeling of standing in an immense, expansive landscape. The scene is painted over aluminum powder that adds a striking brilliance and helps to get a sensation of the cool atmosphere and brightness of an early spring day. The box is constructed from paper-mache. Black lacquer covers the exterior and red lacquer covers the interior of the box. A hinge is fastened to the left of the composition. The box rests on a flat bottom. The work is signed with the name of the artist.